The musician, poet, and teacher was born in 1957 in Nicosia where he had his primary and secondary education there and after completing the Nicosia Turkish Lycee he moved to Istanbul where he studied Turkish Literature at the Istanbul University. 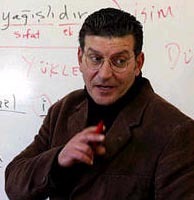 He served as a teacher for 11 years at the following places: "Atatürk Kiz Meslek Lisesi", "Sedat Simavi Endystri ve Meslek Lisesi", "Lefke Gazi Lisesi", "Lefkosa Turk Lisesi", and "Türk Maarif Koleji". In 1992 he reteired from "Türk Maarif Koleji" and helped found a private teaching complex named "Bilgi Dershanesi". Since than he has been an administrator and a teacher of litrature for this place. Taşçı who also has an interest in music started his first group called "Gölgeler" in 1973. The group members were himself, Metin and Mehmet Ileri, Birol and Senol. The latter two members now live in London. In 1974 Taşçı joined the group called "Özgürler". Some of the other members were Salih Niyazi, Rifat Örfi, Serdar Timur, and Sitki Ibrahim. In 1975 the group had a new drummer, Cavit Zabit and changed its name to "Kalenders". In 1975 Tasci also helped forming a group called "Letül". Yoldaşlar: (Yiltan Tasci, Mustafa Akar, Reşat Akar, Sarper Göktürk). Kıbrıs Folk Üçlüsü (Yiltan Taşçı, Serdar Denktaş, and Bülent Berkay who now lives in London). In 1982, he formed a new group called "Oksijenler" along with his brother Mehmet Taşçı and two other friends Hasan Akar and Mustafa Akar. Since 1986 he has been singing solo. Tasci's first casette "Bana Seviyorum De", came out in March 1995 and it contains 7 songs which were composed by himself. Apart from his musical gift, Tasci also published, in 1974, a collection of poems called "Haykirisimiz". Later on in 1983 he published a second book pf poems called "Cig Damlalari". Tasci also researches on writes on litrature review in major newspapers. His published research works include: a book on the characteristics of the Cypriot-Turkish dialect, titled "Kibris Ağzi Dil Özellikleri"(1986) (in Turkish); book which he co-authored on the History of the Turkish-Cypriot Literature, "Baslangictan Bugune Kibris Turk Edebiyati"(1990). His latest work is on the Antology of Turkish-Cypriot Poetry (1995), in Turkish.